"This Is The Moment" debuted at #47 on JazzWeek Top 50 chart for jazz radio play October 9th 2017 and made it to #20 on the NACC Top 30 Jazz Chart for college radio play September 19th 2017. The album is currently in play on over 210 jazz radio programs world-wide including on Public Radio International's "Jazz After Hours" program. "The Brown crew knows how to serve it up just right. With cool school bopping leading the way, this is a cat that easily convinces you to stay out late on school nights to dig." "Every so often a musician and his ensemble come along and stamp their name on today’s musical landscape. With their new release “This is the Moment” (Release Date: September 8th, 2017), led by bassist Nathan Brown, the trio does just that. Joined on the new release by Felix Lemerle on guitar and Peter Traunmueller on drums, Brown and his comrades show why their musicianship and compositional skills are gaining the attention they deserve." "With so much new and timeless instrumental jazz music on hand, the real attraction here is the spirited musical interplay between Brown, Lemerle and Traunmueller. 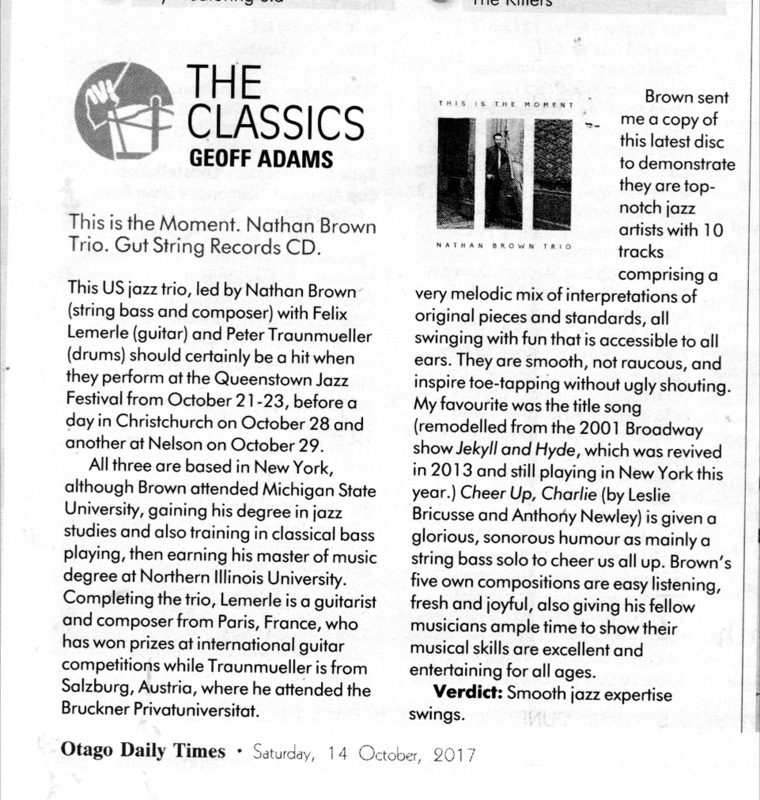 Jazz fans will be in for an excellent sonic surprise with this fine new CD by The Nathan Brown Trio." 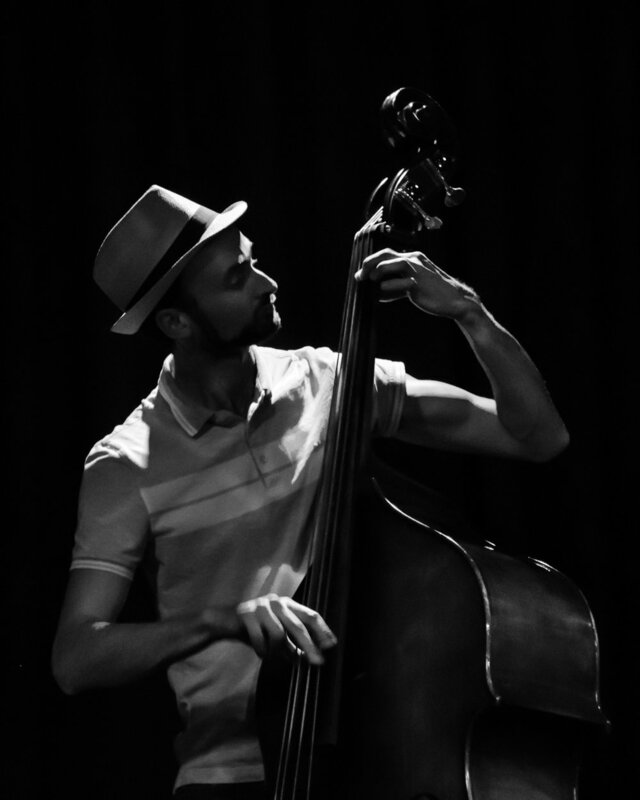 "Bassist Nathan Brown leads a suavely swinging trio with Felix Lemerle/g and Peter Traunmueller/dr through a collection dominated by originals with a few dashes of covers. The team is sublime, with Flemerle showing an allegiance to Kenny Burrell on the subtly bopping “Curley’s Revenge” and snappy “Bird’s Opening” which features the leader bowing like Slam Stewart. Brown shows an ability to dig a deep groove on “Just A Little Lovin’” and the team sounds blissful on the ballad “Cheer Up, Charlie,” and Tranumueller crisply brings everyone to attention on the hip “Don’t Look.” A dream for fans of classy mainstream." 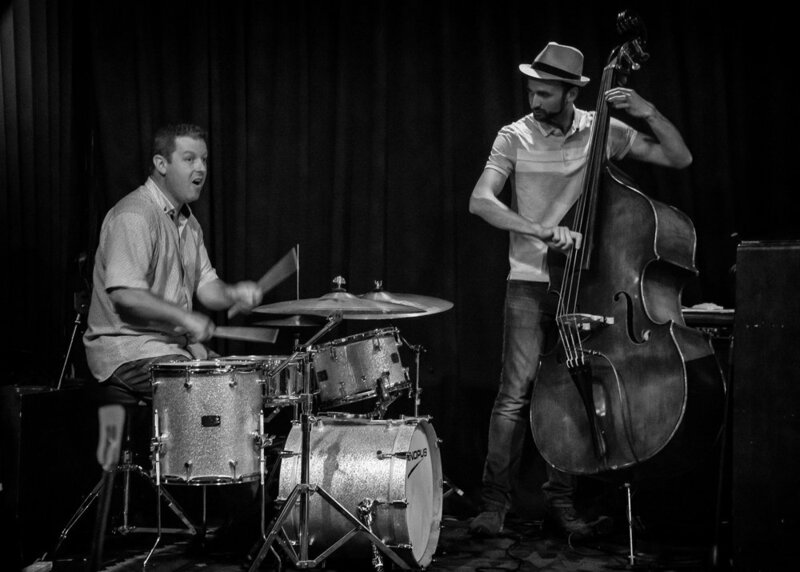 "The New York-based trio serves up a winning sound that’s both invitingly warm and very, very cool. They perform well crafted originals, as well as captivating interpretations of familiar tunes like the Barry Mann/Cynthia Weil classic “Just a Little Lovin’,” which receives a gently swinging treatment here. Other top tracks include “Bird’s Opening,” “Cheer Up, Charlie,” “The Fourth Way” and the title track. Nathan Brown is superb and subtle on upright bass. Felix Lemerle, originally from Austria, is a jazz guitar wizard. And Peter Traunmueller, who hails from Austria, deftly handles the drumming. The interplay among the three musicians is intuitive and zestful." 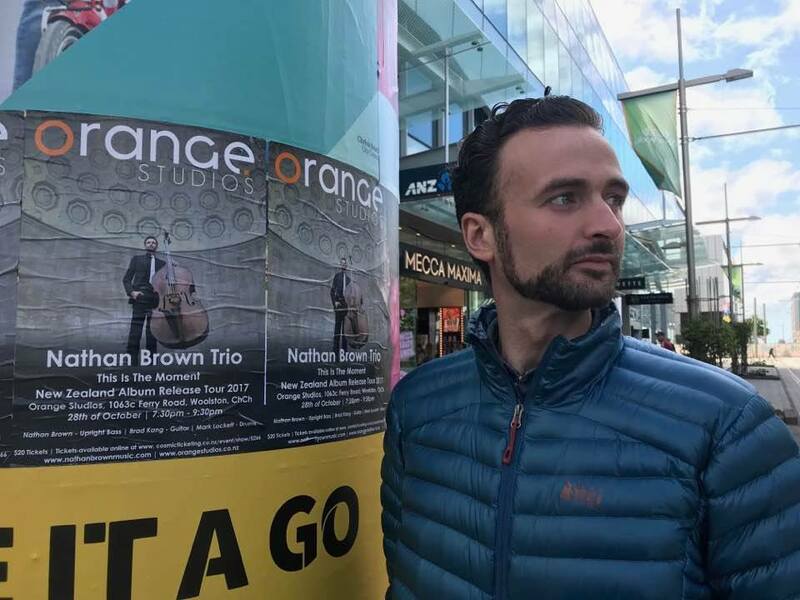 The Nathan Brown Trio "demonstrate(s) they are top-notch jazz artists with 10 tracks comprising a very melodic mix of interpretations of original pieces and standards, all swinging with fun that is accessible to all ears. They are smooth, not raucous, and inspire toe-tapping without ugly shouting." "It was obviously a good time for Brown to emerge as a leader. The right time because his material is superb and his bass playing is burnished by years of gigging and absolutely compelling."